Setae can come in a wide variety of shapes and sizes. They are most often defined by their length and by the shape of their points: sharp, fine, incrassate, spatulate, etc. AphID only uses their lengths. Setae should be measured from base to apex. Bracketed arrows show the points at which to measure the seta length. 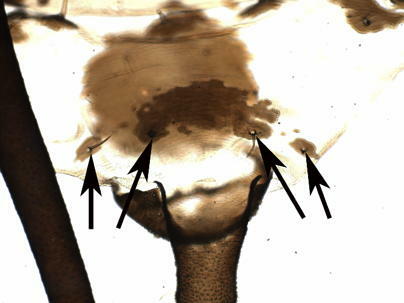 Note that these setae are located on small tubercles (single black arrow). The seta length should not include the tubercle, but unlike this example, in most cases, the tubercle base is extremely small and accidentally including it in a measurement is inconsequential. 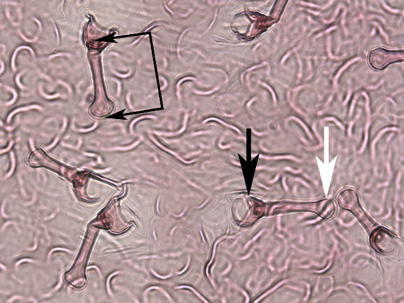 Note that these setae are spatulate, having a broadened tip (white arrow). 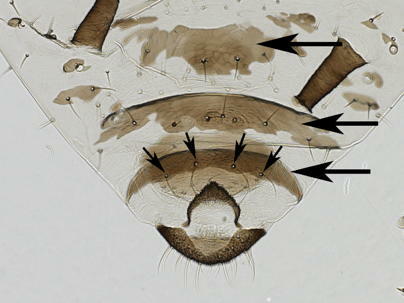 Dorsal abdominal setae can sometimes be hard to distinguish from ventral abdominal setae because the abdomen is flattened in slide-prepared aphids. The focal planes for dorsal and ventral setae are often close, and often overlap if the dorsum or venter is not completely flattened. Although ventral setae tend to be longer and thinner than dorsal setae, be sure to focus up and down on the specimen to help distinguish them. The black arrows point to dorsal setae, several of which are on scleroites. The white arrows point to ventral setae which are out of focus. 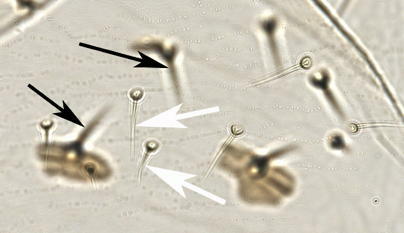 The black arrows point to dorsal setae out of focus, several of which are on scleroites. The white arrows point to ventral setae. The number of setae on the eighth abdominal tergum (the dorsum of the last abdominal segment) can be important to identify some species of aphid. The eighth tergum setae are often all or mostly located on a tergite. Here four small arrows point to the setae, whereas the three large arrows point to the sixth, seventh, and eighth abdominal tergites. Most aphids have two or four setae on their eighth abdominal tergum. 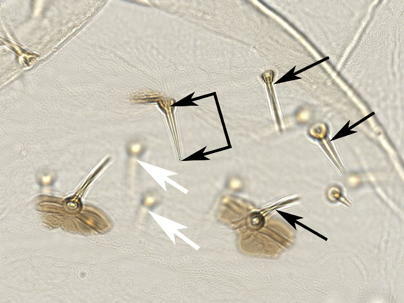 These setae are located on separate sclerites.